You might be thinking of replacing your hot tub with a much newer model and in order to do so you’ll need some help from the professionals. If you want to make a home improvement this holiday season and a new hot tub is on the cards then you should definitely continue reading. For your information most of the materials and chemicals that are used to make hot tubs are quite dangerous to human life. Some of these include: metal, fibreglass, plastic and acrylic. These harmful substances often pollute the water, air and soil which can have a negative impact on the environment. If we are to sustain the environment for future generations to come then we must play our part by practicing eco-friendly hot tub disposal techniques. 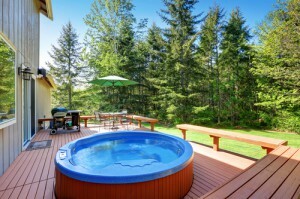 For efficient and eco-friendly hot tub disposal it is always best to seek professional help. A junk removal company possesses all the necessary skills and equipment to remove and dispose of your hot tub using the best industry practices. You can also save a whole lot of time and money when you choose to call the experts. You see eco -friendly junk removal companies will also dismantle and extract recyclable materials as part of the process which helps to fulfill a vital role by protecting the environment and utilizing materials for other purposes that would otherwise be discarded. Remember its about sustainability and saving the planet. Apart from the lengthy and meticulous process of removing a hot tub you then face the challenge of finding the appropriate site for its final resting place. Again here is where contracting a junk removal company is the best solution because we take care of the transporting and processing. Now that’s one less thing to worry about. Here at Junk King we specialize in the removal and disposal of all types of junk including hot tub disposal. We also strive to promote eco- friendly waste removal by incorporating environmentally safe practices as part of our service. Remember we will transport and process your hot tub with no additional or hidden fees. Our top rated and professional services offer many benefits with little or no hassle to you. Keep in mind that these services play a crucial role in our lives as they aim to maintain a clean and wholesome environment and keep the population safe. So to get your hot tub removed visit our website at www.junk-king.com to book online or call us at 1-888-888-JUNK to schedule an appointment right away. This entry was posted in Uncategorized and tagged Hot Tub removal, junk hauling sonoma, Junk King Sonoma on September 26, 2017 by Julian Torres, "JT". Last updated October 26, 2017 .